This article was the Collaboration of the week between 1 September 2007 and 1 October 2007. 6 different from Western world -- StPete or Russia? I moved this page to have a disambiguator. I realize that the Russian city is much larger and well-known than the Floridian one, but I figured if we needed a disclaimer at the beginning of the page, it was worth putting a full disambiguation page in. I think the advice in the Getting into the Hermitage box is a good one, but I was there last week and I found it simpler than what the box suggests. After talking to other people that had been there before I have the feeling that things might have changed since that was written. The STAY SAFE part is to be revised, please! There are typical precautions for every big city (5 mil+) and these do not ESPECIALLY refer to "wild" Russia. "Overall, be warned that if you are used to living in the US and/or Western Europe, Saint Petersburg, as well as the rest of Eastern Europe, will seem different, and, at times, a bit intimidating." Sorry, but I don't think you can compare the safety standard of US cities with Western or Central Europe at all. US cities have their share of gang wars, mafia activity and high crime rates, too and I would not recommend downtown areas in cities like Baltimore, Detroit or L.A. after dark. In comparison Saint Petersburg is somehow in between Western European standards (where unpleasant experiences with hooligans, neo-nazis, etc. also occur...) and most US cities (maybe except from NYC). See: Two years on, this section still should have more contact info and should use the standard listing format for each element * <see name="" alt="" address="" directions="" phone="" email="" fax="" url="" hours="" price=""></see>. Also recent confirmation of the Hermitage tips in the text box would be nice. Do: I'd like to revamp this section. For starters, I think the Mariinsky Theater's name can stand alone without such a wordy explanation, although tips like theatergoing with children have value. Likewise, movie viewing tips can be consolidated. I propose subdividing this section with three subheadings (1-Opera/Ballet/Symphony, 2-Movie Theaters, 3-Canal Boats) with a few listings for each, in standard listing format - after all, the Mariinsky is not the only worthwhile theater in town, but music is certainly one of the highlights of any visit to St. Pete. I could probably also scrounge up some info on canal boat tours in English. Work: Finding work here - and especially work permission - is not easy. Can anyone provide information, or can we plunge forward to Guide status without this section? Eat: Listings could stand to be converted to standard listing format, and I wonder if there's any interest in pulling out vegetarian restaurants into a subheading of their own? Drink: Nightclubs don't have the standard listing, but the article can survive with or without for the moment, I'd say. Sleep: Mostly in good shape, a few listings could be reformatted, and I'm surprised no one has listed the Astoria/Angleterre on St. Isaac's Square. Well, this is absolutely fantastic work you're doing—the article was really messy from a formatting perspective, last time I looked at it. In response to several of your comments: 1) I don't think there's any Piter-specific info for work that doesn't just duplicate what is/should be written in the Russia article. 2) Internet cafes are/were really important for travel here, and I remember there were a few cafes on Nevsky back in 2003 opening up with free wifi. 3) Regarding get around info, we've got a ton of Russian language content on this that I'll try and bring over here. 4) Hospital listings would be really useful; I can take a crack at the prose—I know a fair amount about security issues here (hopefully not outdated, from 2003-4). I lived here for a while, and it's probably my favorite place on Earth, so I'm a bit persnickety on some issues. Before I'd be ok with calling this a guide-level article, we'd need: 1) a more robust drink section; it's not possible for this to be a guide article without, for example, the Stray Dog. 2) Way more eat listings. Petersburg is a great city for foodies and our current coverage is but spittle in the ocean. There should be at least three Uzbek places I can think of, some great Chinese, endless sushi options—I'll at least make a point to add several more really good splurge options. (I hope my places haven't closed, though—I was devastated to hear about my beloved Wooden Pub from 2003!) In general, I'll try and take a closer look at this article over the next week or so, and see what I can help out with via research (and digging through memories). But in short, it's not so much the quality of current content that seems to me a problem, but rather the lack of very significant bits of content. different from Western world -- StPete or Russia? Any objections against moving this to Russia? Be warned that, if you are used to living in the US and/or western Europe, Saint Petersburg, as well as the rest of Eastern Europe, will seem very different,and, at times, a bit intimidating. Totally agree. "Stay Safe" and "Stay Healthy" section do NOT describe the real situation. Should I mutilate Copenhagen's "Copenhagen remains one of the safest cities in the world" ([]) after some guy tried to rob me near the railway station? No, because it IS typical that one can be robbed. Tourist should take TYPICAL precautions for a BIG city. Yes, police is a problem sometimes, so one should always cary a photocopy of passport(the original is to be kept in the hotel's safe locker). Yes, stay away from Romany people(Gypsies). Yes, watch your pockets -- like everywhere else. Drinking water from the tap is not a good idea, but brushing teeth is bloody okay. That's really a very interesting article. Probably I should write a guide on London about the dangers of ethnic criminals, constant fer of muslim terrorist, which are numerous in London, ugly women everywhere and the worst food in the world for pretty solid money. What's really interesting is that the high murder rate does not have anything to do with street crime and "gangs". I think there's a confusion over the term "suburb" in this article. Suburb is a term used to describe an area adjacent to a city, while no being a part of it. Yet, there's a picture of a street with a clear view of St. Isaac's in the background, that is described as a "suburb". Clearly this is not Sestroretsk. I think that whole portion of the article needs to be re-written. I didn't find it much useful to say it's just the same as in Eastern Europe and Balkans--any objections? 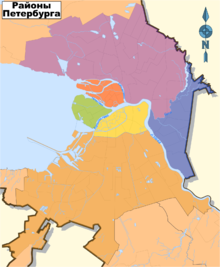 We are districtifying the Saint Petersburg article on the Russian version, and I thought people might like to see the region breakdown here as well, in case we decide to eventually districtify the English version (which will probably make sense once we have a good base to translate from Russian). We are excluding sections of the Federal District considered suburban towns/cities, which will instead be linked from Saint Petersburg (district). Peter, and what about our recommendations on when to districtify? ;-) Maybe we could start with filling with enough content and splitting it into subsections within a single article? BTW, as I could see in a minute, Russian version has much content only on See and, for downtown, on Sleep--but otherwise it doesn't add much: every Buy and Eat is merely a list of chain eateries or malls (both of them are quite disputable to list as we saw recently in WT:Listings discussions). Here is a Saint Petersburg yellow pages directory. It can help you to find a contact information. As I could not find any info on it in Russian or English. If anybody does know of it, please write a listing for it. Thanks. --MarinaK 15:32, 8 October 2008 (EDT)MarinaK. SPb Yellow Pages list it:  (on Russian) with same contacts. This page was last edited on 21 July 2018, at 13:41.